Graphic flooring products from Ultraflex Systems can change the entire look of any building, while creating a perfect branding opportunity. Floorflex Digital is our floor vinyl material, and it is printable on UV and Latex printing equipment. Floorflex Digital is available in 78 inch and 126 inch wide rolls and makes the perfect graphic flooring product for waiting areas, foyers, lobbies and promotional events. 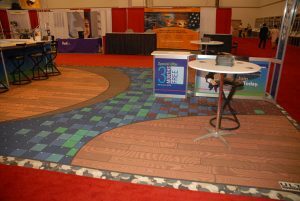 If you’re looking for truly graphic floors, please take a look at our Floorscapes product line. Floorscapes is our latest innovative creation. Ultraflex Systems is able to offer you this commercial grade vinyl flooring product that doesn’t merely create floor graphics – it can actually help you create incredible graphic floors. If you are looking for a more plush graphic flooring solution, UltraCarpet Extra is a white, tufted-pile carpet product. For use with solvent, eco-solvent, UV, latex and screen printing equipment, UltraCarpet Extra can also be used for the same type of applications and comes in widths of 71 inches, 126 inches and 196 inches. Ultraflex Systems is the recognized leader of PVC, specialty substrate and graphic flooring materials. We currently have over 60 innovative materials and each year we introduce a half-dozen or more new products to the industry. All Ultraflex Systems products must meet the highest of standards before being included in our lines of front-lit, back-lit, blockout, mesh or other specialty materials. Our products, from economical to premium grades, are used in countless applications such as banners, billboards, POS displays, window graphics and more. Printed resources such as technical data sheets, fire certificates, warranties and more are available on all products. Ultraflex Systems product specialists are available globally to any answer graphic flooring or other media questions. The United States, Canada and Latin America are covered by our distribution network of highly trained media professionals. Our media experts at Ultraflex Europe handle sales and service for the UK, Europe and the Middle-East. Contact us today to learn more about any graphic floors products available from Ultraflex Systems.